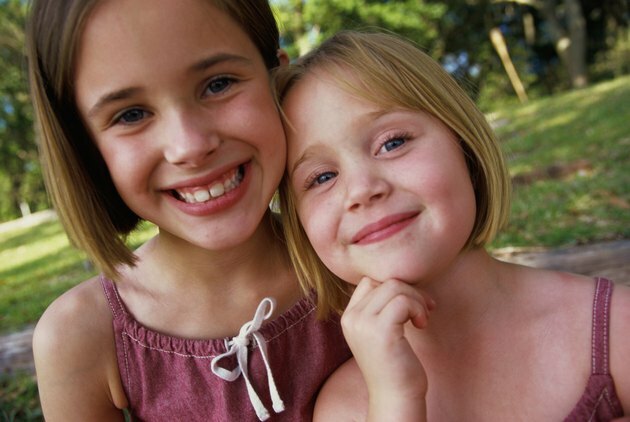 According to Kids Health, self-confidence is a necessary part of being a kid. Children experience many new things as they grow, and having a strong feeling of self-worth will enable children to navigate the growing-up years successfully. Games that do not rely on competition can help build self-confidence by showing children that they can learn new things and accomplish new tasks. Musical Movement is a game that allows children to express themselves as they listen to music, explains Rae Pica and Mary Duru, authors of "Great Games for Young Children: Over 100 Games to Build Self-Confidence, Problem-Solving Skills, and Cooperation." The game requires a large play area and a variety of different musical instruments. Begin by assigning a movement to each musical instrument. Pica and Duru suggest movements, such as stomping for the drums or shaking for the tambourine. Begin playing different instruments and encourage the children to move according to the directions. This game teaches self-expression and builds confidence by allowing children to move to the instruments in the way they feel most comfortable so they can learn how capable they are. Working as part of a team to accomplish a task is an important way to build self-confidence because it teaches children that they are valuable and can contribute their skills in a group setting, says Bernie Badegruber, author of "101 Life Skills Games for Children: Learning, Growing, Getting Along: Ages 6-12." To play this game, you will need a chair for each child and a stopwatch. The chairs are placed in a circle and each child sits down. You yell out a formation, such as a movie theater, and children must work together to move their chairs into that formation. The children are not allowed to make any noise while they accomplish their goal. When the formation is complete, the time is recorded and a new formation is yelled to see if children can beat their time. Badegruber suggests restaurants, buses, trains, circuses and offices as other possibilities. This game builds self-confidence by teaching children how to work together and lets each child know that his efforts are important and valuable. New experiences, such as being the new student at school, can cause fear, says Badegruber, and games can help ease those fears and give children the confidence necessary to become part of a new group. The Grouping Game works to empower a child who is new to the group to notice things about her new peers. All of the players except the newcomer close their eyes and stand in a group. The newcomer gently guides each player to a part of the room based on a common characteristic, such as hair color. Once all the children are put into a group, they open their eyes and try to identify how they are grouped. The game builds self-confidence by encouraging a new student to join into a group and interact with peers in order to build relationships and become a part of the new group.